2. State Sales Taxes: One should choose between state tax deductions and local income tax deductions along with local or state sales taxes. The income tax deduction is perceived to be a better deal, with the IRS stating deductions that can be claimed on sales. But there are some exceptions that can be made to the rule. If you purchased a vehicle, you can add state sales tax to the amount mentioned by IRS for the respective state, till the tax rate doesn’t exceed the general sales tax rate for the state. A similar scenario happens when you purchase home building materials. The IRS provides a calculator to calculate deductions, as per state and income level. This year, the itemized deductions for both state and local taxes are restricted to $10,000 on an annual basis, with the choice of opting for state and local sales tax or state and local income taxes up to you. 3. Prepay Expenses: With tax deductions, prepaying expenses can attract tax deductions too. One can prepay subscriptions, travel expenses, training events, rent, phone bills, Internet bills, insurance, asset repairs, and the like for the next year too. 4. Tax Agent Fees Are Also A Tax Deduction: If you have hired a tax agent to prepare and lodge tax returns, then you can claim the same amount in this year’s returns. Put the amount in section D10 – “Cost of Managing Tax Affairs”. 5. Claim Work-Related Car Expenses: If you use your personal car for work-related purposes, apart from the journey from work to home and vice-versa, you can claim all fuel and car maintenance costs as tax deductions. One can use a 12-week logbook or calculate cents per kilometer method for assessing tax deductions. To be eligible for the same, you need to own the car and the travel should be part of every working day – inclusive of travel between offices, trips to the bank or a trip from one site to another. Claims for home and office travel cannot be used unless you carry heavy equipment or heavy tools for performing your job. 6. Review Your Inventory And Write-Off Damaged Stock: Take a look at your stock, identify damaged inventory and write-off the same, impacting the overall value of trading stock and overall profit margins too. You should consider the valuation of stock trading every financial year, for claiming tax deductions when the opening stock trumps closing stock. 7. Reinvested Dividends: Reinvested dividends offer subtraction when you require it. Mutual fund dividends invested in shares increases your “tax basis” in stock or mutual fund. This reduces taxable capital gain amount when you sell your shares. If you fail to include reinvested dividends and fail to determine your gain, you are overpaying taxes. Figure out the basis for your costs and take credit for every dime set towards reinvested dividends. 8. Charitable Donations: All charitable donations of $2 or more to a registered organization and NGO are eligible for tax deductions. Please maintain receipts of the donations to claim these tax returns. 9. Record Your Rental Expenses: Rental property owners do incur high costs and expenses so one can claim expenses including bank charges, corporate fees, maintenance costs and the like as tax deductions. Keep receipts for furnishing proof for the deductions. 10. Student Loan Interest Paid by Mom and Dad: If Mom and Dad paid the loan, the IRS treats that money given by them to their child, who cleared the outstanding debt. So a child, who is not a dependent, can claim deductions of up to $2,500 of student loan interest paid up by parents. 11. Home Office Expenses: If you work from home, even checking work emails in the evening or on the weekend, you can claim the costs of using your computer or other elements, as a tax deduction. 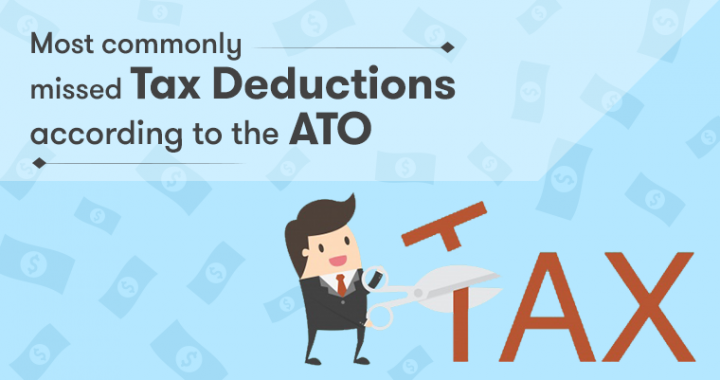 The ATO allows those working from home to claim part of expenses. One can claim ”occupancy cost” if one uses the home office space for the entire work time as a tax deduction. These expenses can cover up software, office equipment, relevant furniture and a part of rent and electricity. 12. Mobile Phone Tax Deduction: Using the personal phone for work calls including clients or other staff members can lead to claims of these calls as a tax deduction. All cost incurred in work-related calls could be claimed. One needs to have a logbook or record to determine work calls. 13. Internet Expenses: If you work from home and need a web connection for the same, you can claim part of Internet expenses as a tax deduction. If you share the Internet usage with a housemate, then a percentage of the cost applies to you. 14. Income Protection Insurance: You’re can claim a tax deduction on insurance premiums against any loss of income, but this does not cover any sort of life insurance or critical care insurance. 15. Child and Dependent Care Tax Credit: The child and dependent care credit can be used through a reimbursement account that pays bills. The law allows up to $5,000 in expenses through the tax-favored reimbursement account. If the limit of $5,000 is reached, one can claim the credit on an additional $1,000, thus cutting down tax bill by $200. 17. Self-Education Expenses: You can claim self-education expenses if the study is connected to your role in business. You can claim expenses for the tax deduction of expenses related to purchase of professional textbooks, trade journals, stationery, computer expenses, union fees, accommodation, travel expenses, and the like. 18. Sun Protection: You’re entitled to tax deductions for any heat protection gear like sunglasses if your employment requires outside work for prolonged periods. The ATO expects that the work should go around the entire year, for any claim in depreciation on glasses. Is It Worth The Trouble to Claim My Deductions? Claiming tax deductions can save you a hell lot of money than what you would assess in the first place. The commonly missed tax deductions can be the ones that can be spotted and leveraged for maximum benefits. The trouble will always be worth it!